What people most long for in times of continuous drought is rain. Yet, what if the drought is not owed to a shortage of liquidity but to climatic barriers in the ecological system itself? Axel Stockburger’s art project focuses our attention on such a situation. Quantitative Easing (for the street) is not concerned with vagaries of the weather, though. In one of Vienna’s most liquid places, the artist points out a climatic change in the global economy whose present crisis is not characterized by shortage but by abundance. Quantitative easing is a strategy in an extreme crisis of confidence in which banks restrict their function as lenders and become barriers within their own ecosystem. In order to prevent a collapse of the money circuit, central banks buy financial assets at the public expense and thus introduce new money into the ailing financial system. Stockburger transfers quantitative easing from the stock market to the streets – to the terrain of the general public whose social climate is reflected in its level of debt. 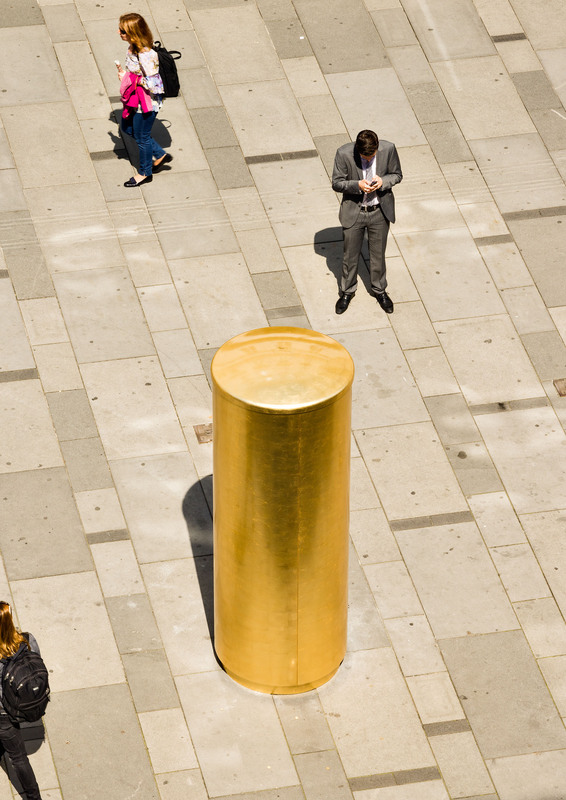 A golden cylinder serves the artist as the “central bank,” which randomly distributes euro coins in the street. While the financial system mainly serves commercial banks, everybody may make a grab and become an agent of distribution here. Stockburger‘s intervention in the public realm raises the pressing question what money, the creation of value, and distributive justice mean to us. What are their social, economic and artistic fictions based on? Which desires do they fulfil? Quantitative Easing (for the street) reminds us that the streets are the sites of conflict and “social transactions” (Stockburger) where capital is not everything that matters and aesthetic, social and political wealth is realized.